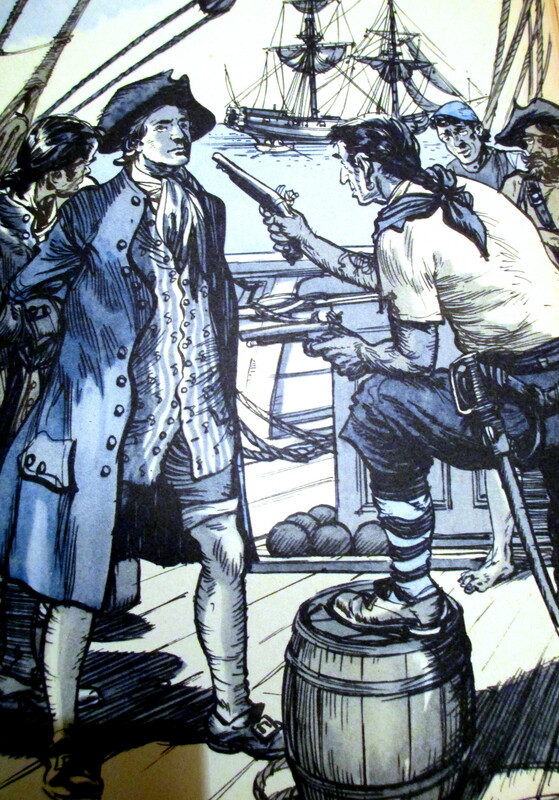 Inset is from “The true story of the Amazing adventure of Philip Ashton of his capture by pirates and of his escape” which is one of the illustrations by William Nickless for the Daily Mail Boys Annual. William Nickless was born in Brentwood, Essex, on 4 April 1902, the son of William Thomas Nickless and his wife Ada Caroline (née Bayliss), who married in London in 1899. He was the second eldest of five children and grew up in north St. Pancras, where his father worked as a builder’s clerk. Although interested in drawing from an early age, he followed his father’s wishes and first worked at an engineering factory in Acton; however, he kept up his drawing and eventually found work as an artist at Gameges department store, where he drew illustrations for their mail order catalogues. He then joined Temple Press, working on their magazines The Motor, Aeroplane, Motor Cycling and Commercial Motor. Nickless went freelance in 1940, working for various magazines, including the Radio Times, and advertising agencies. He also set up his own press, printing limited editions of his poetry and a series of anti-war etchings which were reproduced in New Leader in 1939. During the war years he developed an interest in music and took up the violin, which led him to making several himself. His other hobbies included making model engines and astronomy, for which he used a reflecting telescope he had constructed himself. After the Second World War, Nickless became a popular illustrator for children’s books and annuals (including Eagle and Swift annuals). Between the 1940s and 1970s he illustrated the Worzel Gummidge books of Barbara Euphan Todd and classics by John Buchan (The Thirty-Nine Steps), Thomas Hughes (Tom Brown’s Schoolday’s) Jonathan Swift (Gulliver’s Travels). H. Rider Haggard (Allan Quatermain, King Solomon’s Mines, Ayesha, She, Nada the Lily) and George Macdonald (The Princess and the Goblin), as well as contemporary adventure and historical adventure novels for both boys and girls, school stories and fairly tales. As a writer, Nickless penned a series of books about anthropomorphised animals, beginning with Owlglass in 1964; these are said to have been inspired by his living at Heathfield House, a Victorian house hidden within the Wealden Forest. Nickless lived in Rotherfield, Sussex, for many years where he died in early 1977, aged 74. This entry was posted in Illustrations, Paintings and tagged #Children'sBooks, #Illustrators, Daily Mail Boys Annual, Eagle Annual, Owlglass, Swift Annual, Worzel Gummidge, writer. Bookmark the permalink.